Nicely built, straight-forward in use and designed to craft great sound. Clever filter options offer versatility and ease of use. Clear, honest sound. 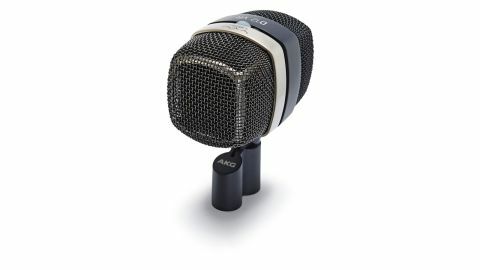 The D12 VR from Austrian mic-maker AKG is a reference quality bass drum mic suitable for both recording and live work. Lookswise, the D12 VR's twin grilles and full metal casing are a clear nod in the direction of the company's legendary D12 mic but under the bonnet is a set of modern components. "As well as offering different options in the studio the filter settings also make nailing a killer live sound a breeze"
Plugged into the mixing desk in the normal manner, the D12 VR works as a regular passive dynamic mic; it has an ultra-thin diaphragm to pick up every scrap of detail and an optimised bass chamber to capture the low frequencies. Add in Phantom Power and three active filter presets can be engaged to shape the sound further. Coloured LED lights indicate which of the filter presets are selected while a handy graphic above the sliding switch gives a visual indication of each filter setting. AKG reckons that as well as offering different options in the studio the filter settings also make nailing a killer live sound a breeze, especially when switching from one band's kick drum to that of the following act. With a frequency range that begins at a trouser-flapping 17Hz and climbs to 17,000Hz plus a whopping 164dB maximum sound pressure, even the most lead-footed Neanderthal would struggle to make it peak out. In common with all premium AKG mics, the D12 VR is manufactured in Vienna. We test the mic in a studio setting, starting with the D12 VR, positioning it just in front of the ported and Kickported front head of our bass drum. In its unfiltered passive dynamic mode the D12 VR puts the kick right at the heart of the mix, giving such a quality sound that the EQ pots remain untouched. The combination of attack and depth delivers focus and 'oomph' in equal parts. Dialling in the middle filter preset (red light) scoops out some of the mid-range frequencies in order to leave space for other instruments in the mix. Here the drum does sound tighter and not quite as thumpy - there's more front note and less overall force. Flicking the switch to the left (green light) adds a bass boost to the mid-range scoop. This produces a wider sound and the response from the kick is a fatter and more saturated note. Sliding the switch to the right for the third and final position (blue light) the two existing frequency adjustments are joined by a high-end boost. In this configuration there is more presence and airiness to the kick as well as plenty of depth - more of a live room sound. While the filter options give the D12 VR a thoroughly modern degree of versatility, the sound it produces as a straightforward dynamic mic is so honest and strong that it's a good enough reason to own one.